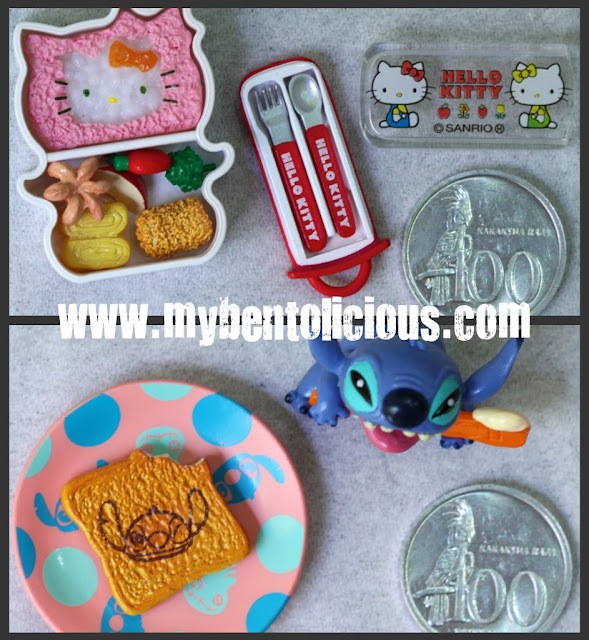 I wanted to post some tips on making some animal shapes from sausage this weekend but I found 2 sets of cute Hello Kitty's bento and Stitch's breakfast miniatures that I couldn't resist to share it with all of you. After the Sunday service at the church, we went to a mall to have lunch and my daughter asked me to buy some hairbands. So when I and her were hunting some hairbands, I found this little store with all cute stuffs inside. They sold cute miniatures with many characters. After looked around for quite sometimes, I found those 2 sets displayed on their shop display. The store just have 1 set for each, so I bought my first 2 set of miniatures and perhaps I will buy again next time (???). Took some pictures and put the 100 Rupiah coins as comparison (the diameter for 100 Rupiah is about 2,5cm). @Anncoo : Thanks Anncoo! 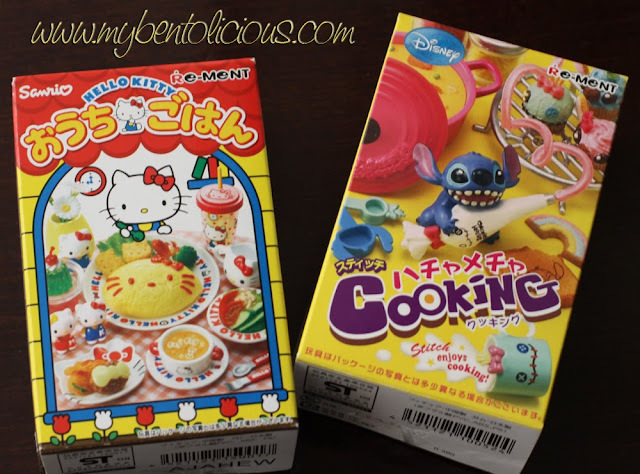 I think you can get it from Takashimaya or any other Japanese store that sold toys? 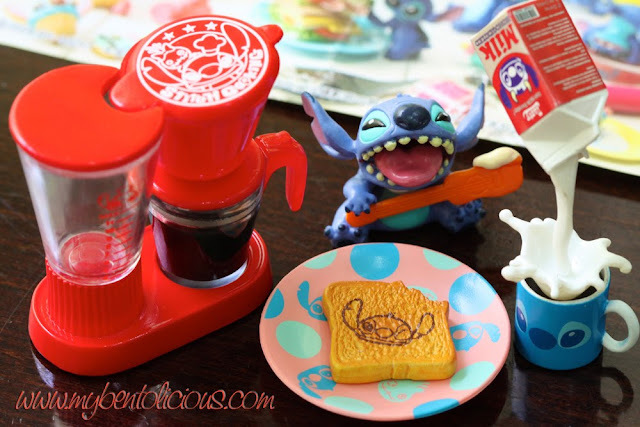 Beware Lia, once you start collecting Re-Ment you will become addicted! I follow lots of Re-Ment collectors and they cannot resist!! 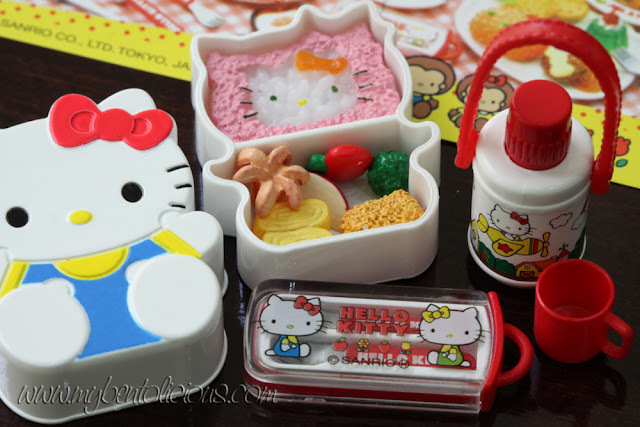 Luckily I have never purchased any, although I LOVE the mini bento sets to pieces! Soooo cute!! these are cute, tks for sharing and great idea for using the coin to allow us to gauge the size.